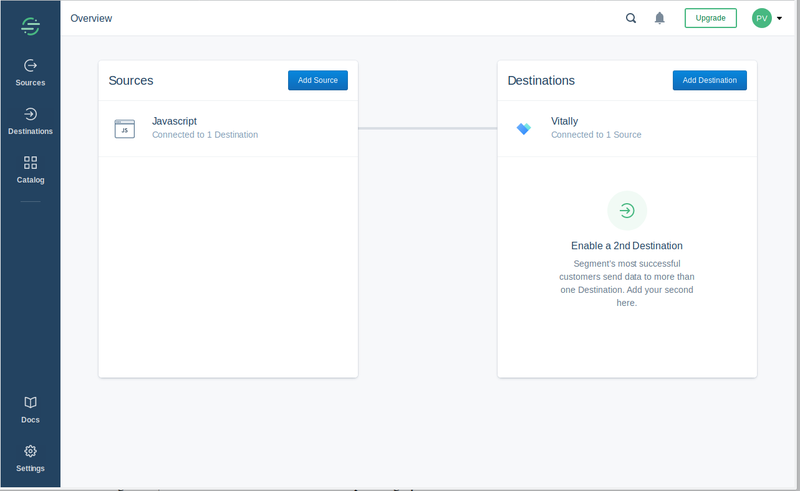 Vitally is a customer success platform for B2B SaaS companies that wraps your unified customer data with powerful analytics, alerts, and workflows to help you build successful customers. This destination is maintained by Vitally. For any issues with the destination, please reach out to their team. NOTE: Vitally is currently in beta, and this doc was last updated on February 7, 2019. This means that there may still be some bugs for us to iron out and we’re excited to hear your thoughts. If you are interested in joining or have any feedback to help us improve the Vitally destination and its documentation, please let us know! The first step is to make sure Vitally supports the source type and connection mode you’ve chosen to implement. You can learn more about what dictates the connection modes we support here. Enabling Vitally as a destination in Segment can be done in one click from your Vitally account. These instructions are also detailed in the Vitally help center. 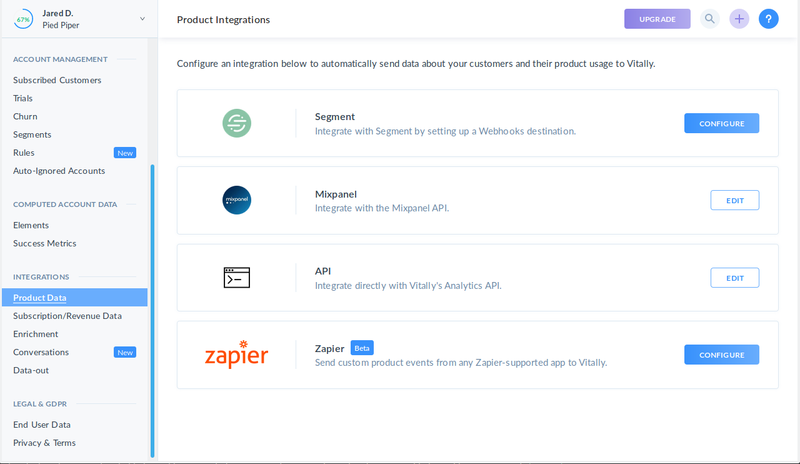 Navigate to the Segment integration page within your Vitally account. This can be found in your Account Settings in Vitally by navigating to the Product Data integrations list. Identify calls are used by Vitally to maintain a picture of a single user. The traits you pass to the Identify call will be displayed on the user’s dashboard and can be used for sorting and filtering users within an account and across all of your users. Track calls are used in Vitally to track and analyze your accounts’ engagement with your product. Vitally provides out-of-the box analysis on your events, plus the ability to define your own custom metrics on top of those events, like Success Metrics and Elements. Group calls are used by Vitally to maintain a picture of an account. Any traits you pass to the Group call are added to the account in Vitally and can be used to analyze your customer base as a whole. You can view a customer’s traits on their dashboard, use them for sorting and filtering, configure rules to automate your customer success process, and even create segments of your accounts.